^ a b c d e Neẓāmī. Encyclopædia Britannica Online. Encyclopædia Britannica. 2009. Retrieved February 28, 2009. excerpt: Greatest romantic epic poet in Persian Literature, who brought a colloquial and realistic style to the Persian epic. .... Nezami is admired in Persian-speaking lands for his originality and clarity of style, though his love of language for its own sake and of philosophical and scientific learning makes his work difficult for the average reader. ^ "Ganca (Azerbaijan) - Encyclopædia Britannica". Britannica.com. Retrieved 2014-03-23. ^ "Nizami Ganjavi - USSR Politicization - Iranian Persian Civilization - Nezami Ganjei". Azargoshnasp.net. Retrieved 2014-03-23. ^ Gandzakatsi, Kirakos. Kirakos Gandzakats'i's History of the Armenians / translation from Classical Armenian by Robert Bedrosian. — New York: 1986. — p. 197 Excerpt: "This city was densely populated with Iranians and a small number of Christians. Kirakos Gandzakets' Patmut'iwn Hayots' [Kirakos of Gandzak, History of Armenia], edited by K.A. Melik'-Ohanjanyan, (Erevan, 1961), p. 235: "Ays k'aghak's bazmambox lts'eal parsko'k', ayl sakaw ew k'ristone'iwk'..."
^ a b "ON THE MODERN POLITICIZATION OF THE PERSIAN POET NEZAMI GANJAVI: Siavash Lornejad, Ali Doostzadeh: Free Download & Streaming: Internet Archive". Archive.org. 2001-03-10. Retrieved 2014-03-23. ^ a b c d e f g h i "NOZHAT AL-MAJĀLES – Encyclopaedia Iranica". Iranicaonline.org. Retrieved 2014-03-23. ^ Author passed away 700 years ago. "Nozhat al-Majales". Retrieved 5 April 2018 – via Internet Archive. ^ a b c "VIS O RĀMIN – Encyclopaedia Iranica". Iranicaonline.org. 2005-07-20. Retrieved 2014-03-23. ^ J.T.P. De Bruijn (December 15, 2002). "ḤADIQAT AL-ḤAQIQA WA ŠARIʿAT AL-ṬARIQA". Iranica. Retrieved 2010-09-06. ^ a b "ḴĀQĀNI ŠERVĀNI i. Life – Encyclopaedia Iranica". Iranicaonline.org. Retrieved 2014-03-23. ^ a b "ḴOSROW O ŠIRIN – Encyclopaedia Iranica". Iranicaonline.org. Retrieved 2014-03-23. ^ a b c d e "ESKANDAR-NĀMA OF NEŻĀMĪ – Encyclopaedia Iranica". Iranicaonline.org. Retrieved 2014-03-23. ^ "FARHĀD (1) – Encyclopaedia Iranica". Iranicaonline.org. 1999-12-15. Retrieved 2014-03-23. ^ a b c d e f g "LEYLI O MAJNUN – Encyclopaedia Iranica". Iranicaonline.org. 2009-07-15. Retrieved 2014-03-23. ^ a b c d e f g h i "HAFT PEYKAR – Encyclopaedia Iranica". Iranicaonline.org. Retrieved 2014-03-23. ^ The Russian philologist Ivan Mikhailovich Steblin-Kamensky, Professor and the Dean of the Oriental Department of Saint Petersburg University comments("Oriental Department is ready to cooperate with the West", Saint Petersburg University newspaper, № 24—25 (3648—49), 1 November 2003"). http://www.spbumag.nw.ru/2003/24/1.shtml – Accessed February 2008. Низами писал свои стихи и поэмы на персидском языке. 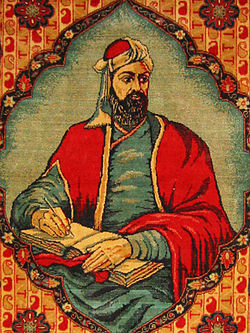 Nizami wrote his poems in Persian language. ^ "ḴAMSA-ye JAMĀLI – Encyclopaedia Iranica". Iranicaonline.org. Retrieved 2014-03-23. ^ "Kara Karayev (Azerbaijani composer) - Encyclopædia Britannica". Britannica.com. Retrieved 2014-03-23. Central Bank of Azerbaijan. National currency: 500 manat. – Retrieved on 25 February 2010. ^ Central Bank of Azerbaijan. Commemorative coins. Coins produced within 1992–2010 Archived 2010-01-19 at the Wayback Machine: Gold coins dedicated to the memory of Nizami Genjevi. – Retrieved on 25 February 2010. ^ Huseinova, Aida. "Muslim Magomayev Celebrates 60th Jubilee". Azer.com. Retrieved 2014-03-23. ^ "Nizami Ganjavi 'one of most prominent figures in Azerbaijani culture'". News.az. Retrieved 2014-03-23.